It’s been over three weeks since my last post and therefore time for an overdue update. Some of this is repetitive for those of you who follow me on Facebook, but some of it is new information. My silence has been largely attributable to our nine-day trip to Costa Rica from which we just returned this past Saturday. It was a glorious vacation full of adventure, swimming, wildlife and beauty (despite the 30+ insect bites I got). More about Costa Rica and some photos later this week (hopefully). But for this post, I have a broad range of somewhat random news and announcements. For once, it’s all good news and exciting things I have to share. I’m sure you all get tired reading depressing posts, so I hope you enjoy this one! As I discussed in An Intermission For An Update On The Realities Of Life With Cancer, I was having some insurance issues as my insurance company had denied coverage for my Avastin treatments post-HIPEC. The denial meant that I would have had to pay $10,000 per treatment for the Avastin, the prospect of which had me and Josh rather stressed. My oncologist, Dr. C., wrote a letter to the insurance company challenging the insurance company’s position and asked for an expedited response. Within 24 hours, the insurance company had overturned its denial. My faith in my insurance company was restored. What a relief! I was supposed to have my CEA tested right before leaving for Costa Rica, but opted not to just in case the results might cast a cloud on my vacation. So it was tested yesterday when I went in for my ninth treatment of folfiri. It was 3.6! That’s the lowest it’s ever been, and a drop from 4.8 six weeks ago. 3.6 is squarely within the normal range. Again, we want to see it go down even lower, to 0 ideally. The downward trend means either the targeted chemo provided by HIPEC was successful, the systematic chemo I’ve been receiving since HIPEC is working, my surgical inflammation is greatly reduced or all of the above. Yay! Of course, I have to caveat this good news with the warning that I’ve known many who have Stage IV disease who attained and sustained a normal CEA, even for a significant period of time, only to have it rise again (and rather quickly at that) while off treatment, and even during treatment. A normal CEA is a highly elusive thing for those of us with Stage IV disease. At the prior treatment, I expressed to Dr. C. my fervent desire for a chemo break come October. I will finish this cycle of chemo at the beginning of October, after which I will have another scan. Then, I will discuss what to do next with my doctors. Dr. C. was very noncommittal about whether he would grant me a break – “We’ll see” he said. I will give his opinion much weight; after all I feel like he has brought me this far. But I really want a break from chemo. It will be more than 15 months of surgeries and treatments come October. I’m tired. But mental and physical fatigue is just one of those things I just may have to tolerate until the time when we are all comfortable with me coming off chemo. Recently, the 2014 U.S. News & World Report ranking for cancer centers was published. Memorial Sloan Kettering is #1 this year; NYU is #50. I forwarded the rankings to Josh and asked him if I should be bothered by the fact that I’m receiving treatment at a #50 institution. After all, I’m Asian and was raised to care about rankings. When I was applying to college and law school, I obsessed over the U.S. News & World Report school rankings, as did my father. He couldn’t read the rankings in English but they were reproduced in Chinese at the back of the Chinese Yellow Pages. He knew the rankings better than I did and always urged me to go to the best, under any circumstance, even if I had borrow tons of money. Josh told me that thus far there hasn’t been anything unconventional in my treatments and under my NYU oncologist’s care I’ve achieved great results. It’s true. I’ve been very pleased with the kind of care I’ve received at NYU. I email and call via cell my very senior oncologist and he responds instantly. He also handled my insurance issue quickly. I’ve yet to meet any patient at Sloan who receives that kind of attention. Every NYU doctor I’ve encountered has only had the highest praise for Dr. C. So for now, I’m trying to unlearn the high premium I’ve traditionally placed on rankings. The time may come when I should travel 20 blocks north to Sloan but that time is not now. First, Cleary Gottlieb, my employer, is hosting a fundraiser for my fund, the Julie Yip-Williams & Joshua R. Williams Research Fund, on September 10. All current Cleary attorneys and administrative staff based in the New York office and all Cleary U.S. based alumni should have received a Save the Date for the event; the actual invitation will be sent out in the next couple weeks. There’s already been an amazing response. I’m super excited. I will speak briefly, as will Michael Sapienza, CEO of the Chris4Life Colon Cancer Foundation as will Dr. John Marshall, a preeminent GI oncologist from Georgetown. The presentations will be short, to be preceded and proceeded by cocktails and food. My parents will be in town then, so they will be attending as will my daughters. I’m very much looking forward to seeing so many I haven’t seen in a long time. I am also helping to organize, and will be participating in, the second annual Scope It Out 5K run/walk in NYC on September 20 on Roosevelt Island. Don’t worry – I have no real intention of running the race. Proceeds from the race will go toward funding colorectal cancer screenings in New York City as well as research at Sloan Kettering. I’ve formed a team called Team Invictus, for my favorite poem and one of my personal favorite blog posts. Here’s the link to register. I hope those who can’t donate to my research fund and who are in NYC will consider joining my team for the walk. The registration fee is currently $30 but will go up to $35 on August 20. With this event, my intention is not to raise money. I’d rather have any donations go directly to my research fund because finding a cure is my absolute priority. My objective with the race is to bring greater awareness to the community and have some fun. Finally, I wanted to share this picture of me and my mother. My parents are visiting NYC for a month. After I got back from Costa Rica, my mom came over and handed me this piggybank and said, “This is for your research fund.” I responded, “Oh thanks Mom. I’ll let the girls put coins in it and then when there’s enough, I’ll put it into the fund.” I promptly put the piggybank in the girls’ room and forgot about it. My mother came over again this morning and informed me, “You know, there’s real money in the piggybank already.” I was stunned. If you’ve read Shaping a Legacy, you would understand that charitable giving in this way is not in my family’s makeup and I argue not part of Chinese culture. My father helped me pull out the many bills and I counted $340! 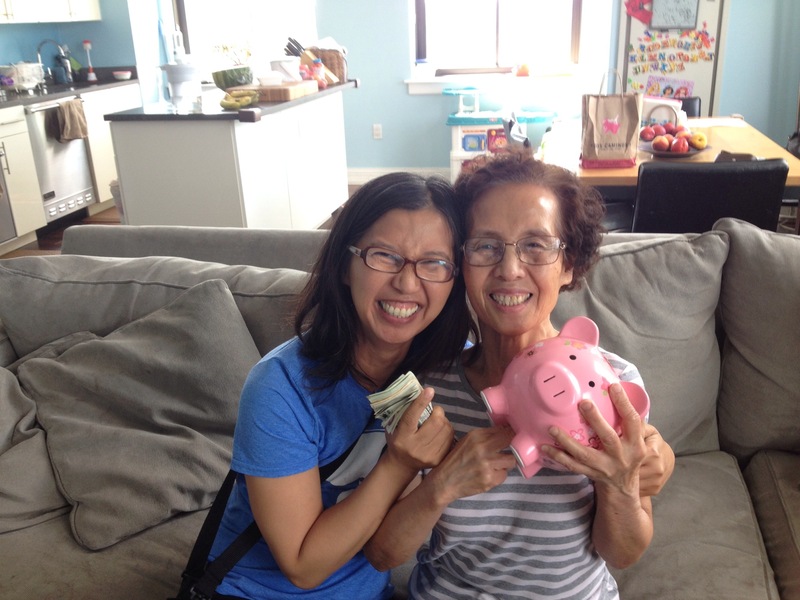 My mother had been saving part of her tip money – she’s a manicurist – for the last two months, shortly after she learned about my fund. It goes without saying that my parents don’t have much money. I was incredibly moved. My mother has never told me once that she loves me, not once, nor do I think she will ever tell me so. But she shows me by her actions. And perhaps, this is among the loudest and most emphatic actions of all. Josh and I used to have debates about the merits and demerits of a culture that does not promote declarations of, “I love you.” Josh thinks it is cruel. I think Americans say the words too easily and that words are cheap. Josh calls me the Inscrutable Asian because I don’t express verbally love that frequently or easily (except to my children) – it drives him crazy. I still contend and will forever contend that actions mean a lot more than words, and that when the actions are loud enough, the words are not necessary. Obviously, there’s nothing wrong with showing love through both deed and words. Unfortunately for Josh, the inability to say the words so easily is not something I can un-learn entirely at this point. But I can write about love quite easily and can even declare it quite easily in writing. I LOVE YOU, MAMA! Julie, I’m so happy you had great trip! Can’t wait to see photos. Also happy the insurance issue was resolved quickly. I work for a major health insurance company & didn’t want you to have bad taste regarding all insurance. I just love this blog, great news regarding CEA results. I’m now on folfori, hoping it will drop my numbers. Wonderful that you had a great trip and that story about the gift from your Mom brought me to tears! What a great pic of you and your mom! Hi Julie, I hope this note finds you feeling well. I wrote to you some time ago when I signed on for your mailing (I think via Flatbush family network). I continue to think of you and feel grateful for each mailing I receive from you. My own mother is currently reportedly in remission but was on monthly chemo maintenance, which stopped due to side effects. She finally said yes to meeting with an acupuncturist. I know you have one in Queens whom I believe is a cancer specialist. If so I’d like to meet with the dr. May I have his info? Would you recommend him? Thank you so kindly for sharing your journey so openly. I wish you and your family the best very often, not only today!